In our part of the world, autumn can be a somber time of year. Most days, we wake up to grey skies, drive to work amidst the "morning fog," and come home in the dark. It rains or it drizzles and rains and drizzles and the damp air clings to one's clothes, seeming to burrow through to the skin or even, when the temperature so drops, through to the bone. We do not get the reds, the oranges, the ochres of changing foliage around here: what we do get are the deep serious greens of pine trees and other evergreens. There's a certain beauty to all this sobriety and I find the season quite calming. However, some people might find the autumns and winters here gloomy, which is why we thought a visit to a happy-making place is in order. What could be better than looking at this display of beautiful colours and tasting the vibrant flavours within? 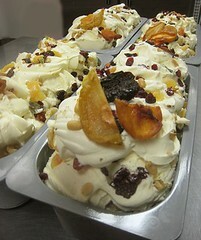 But we aren't content merely to taste the available flavours of gelato and sorbetto they have today. No, no. 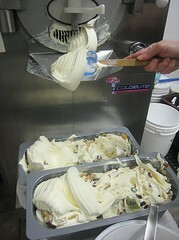 We bring you a behind-the-scenes look at making gelato at a local gelateria in Vancouver. But first, we have to learn about gelato and sorbetto. 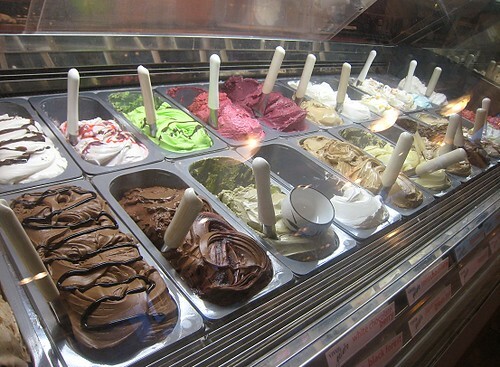 For those unfamiliar with gelato and sorbetto, VIVO! Gelato explains the difference. 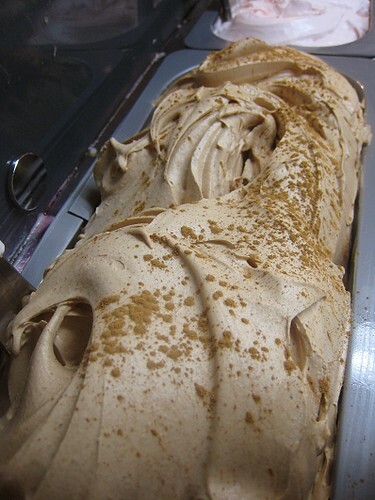 Simply put, Gelato and Sorbetto are Italian-style ice cream. 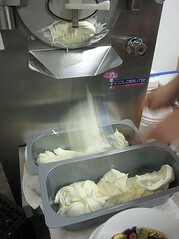 Traditionally, gelato is made with only milk, instead of milk and cream as per the standard for ice cream. For the sorbettos, it's all non-dairy. 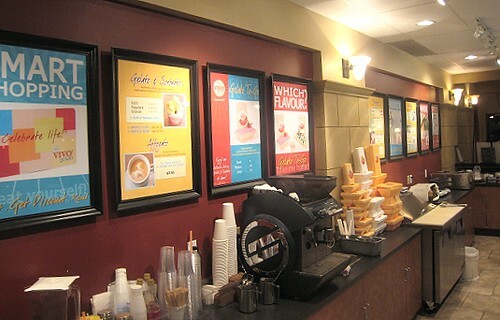 Because gelato is made only with milk (instead of milk and cream), the butterfat in gelato is considerably lower than standard or premium ice creams. 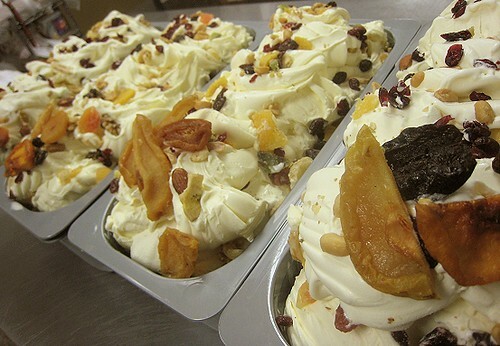 Depending on the flavour, the butterfat in gelato is around 4% to 10%, compared to 15% to 18% in regular ice cream and up to 24% to 28% in premium ice creams. 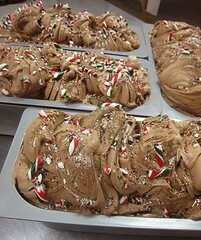 This is a surprise to hear because gelato always seems to feel richer on the mouth than regular ice cream. 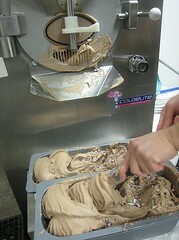 People thus assume that gelato contains so much more fat than regular ice cream. 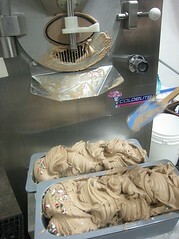 Or lack thereof, for traditional-style, artisan gelato and sorbetto. 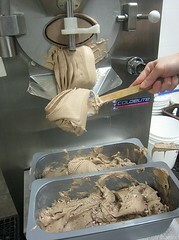 Commercial ice cream contains a lot of air. For example, if one lets a tub of ice cream sit out on the counter and melt, the next day one will probably find that the ice cream has shrunk to only about half of its original volume. 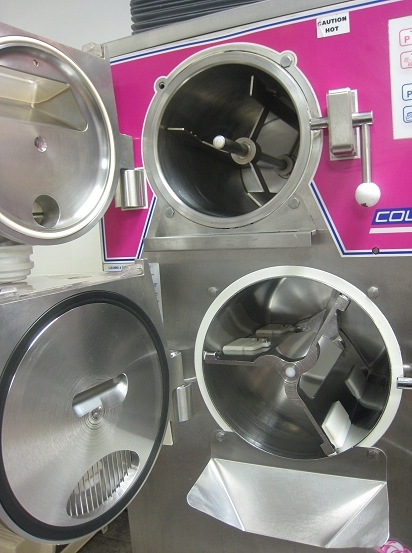 Most commercial creameries use big, humongous machinery to make ice cream and these machines are fast, creating and whipping a lot of air into the ice cream. 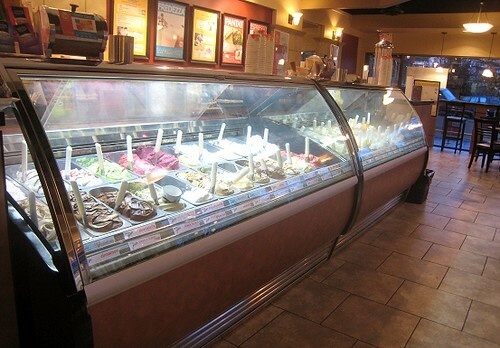 Artisan gelato, on the other hand, has less or little air. 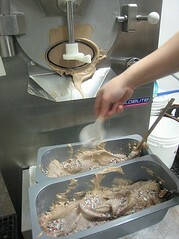 The gelato-making process is slower. Slow is good, because slow means a better product, much denser and much smoother. Hence, gelato tastes so much more flavourful and richer, even with considerably less fat, because we do not get all that air to dilute all the flavour. Now it's time for a field trip. VIVO! Gelato, a local gelateria here in Vancouver. 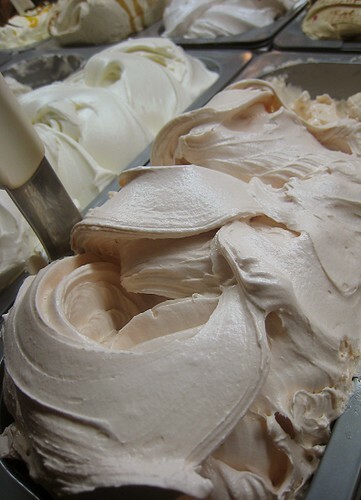 We bring you a behind-the-scenes look at making gelato. 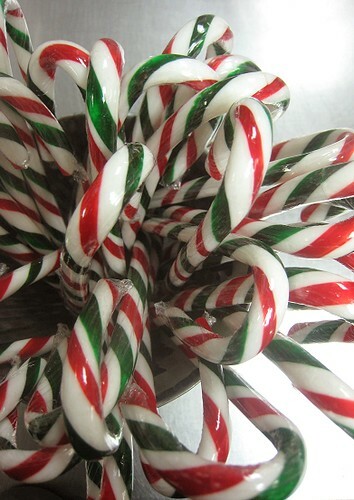 Coming up, two new holiday flavors. This is how the magic is possible. It is pictured here not quite fully-assembled. There are two chambers. 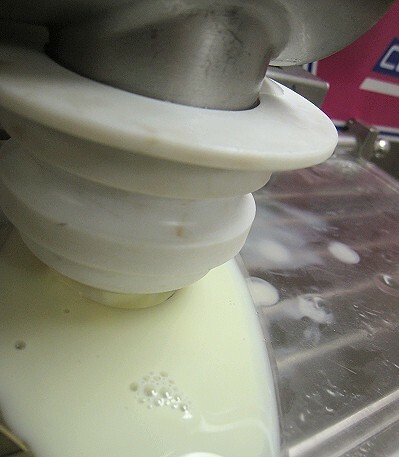 The smaller top one is the pasteurizer. The mixture goes in here and gets heated. After that, a lever is pulled and the heated mixture flows down to the larger second chamber, where it is then churned and cooled/frozen. 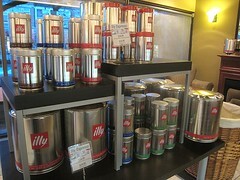 When the liquid mixture has become gelato, a little "door" is opened and the gelato exits here and is mounded into pans. 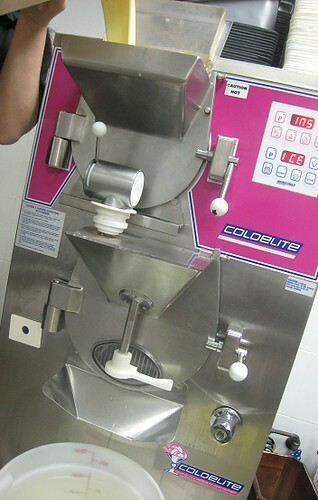 What flavors of gelato are going to come out of the machine this day at VIVO? 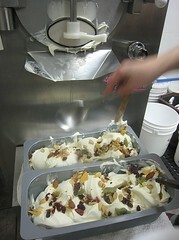 Creamy, custardy gelato studded with dried fruits (kiwi, pineapple, strawberry, cranberries, papaya, mango, ...) and nuts. 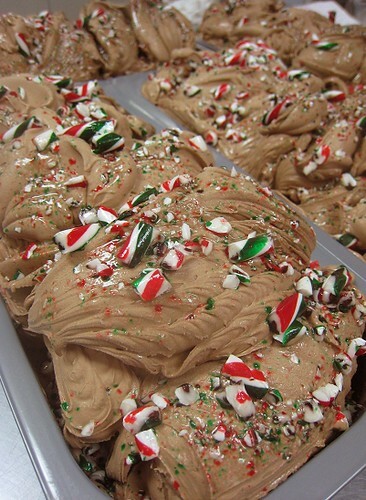 Chocolate gelato with bursts of peppermint candy cane. 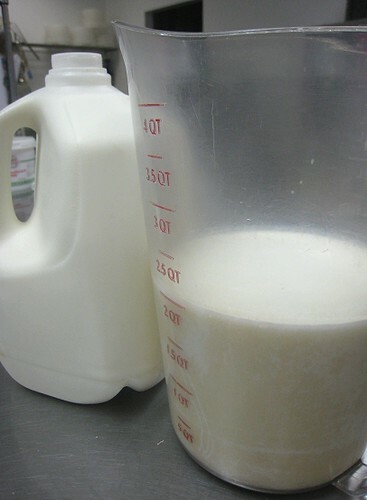 That's a lot of milk. As said, milk and no cream. 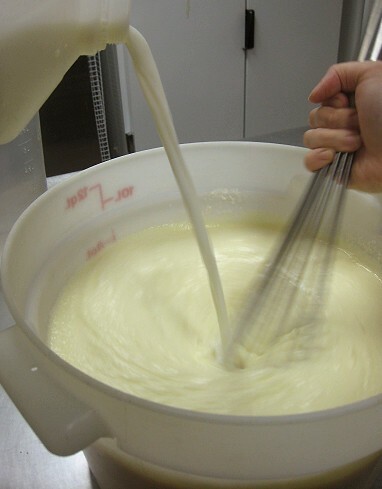 Whisking milk to make the base for Christmas Cake flavor. 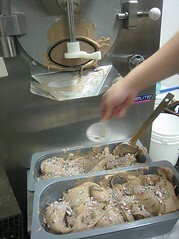 Chocolate gelato mix waiting to go into the machine. 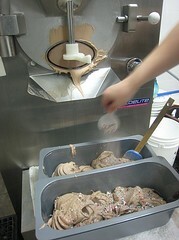 Gelato mixture being poured into the top chamber of the machine. 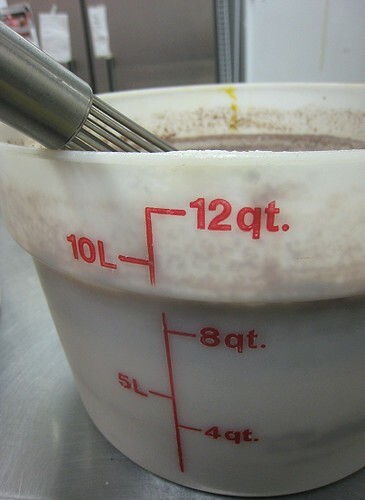 We had to wait a little bit for the top chamber to heat the mixture to the appropriate temperature. Then, the lever was pulled and the heated mixture flowed into the second chamber. Mixture flowing from the top chamber to the bottom chamber. Now for the exciting part: the mounding! We had a tripod set up to take these photos. 2 pans are mounded at a time. 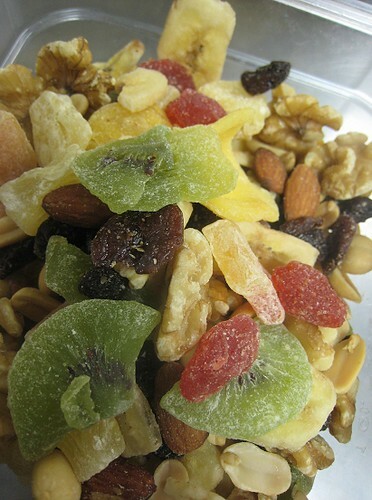 The mixed fruits and nuts are standing by, ready for mixing in. 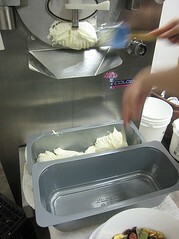 As the gelato comes out of the little "door", a spatula is "scraped across" the opening to obtain that gelato mound. That mound is placed in the pans. 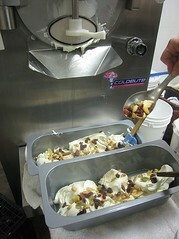 left: The little "door" is closed so the fruits and nuts can be sprinkled onto the gelato. 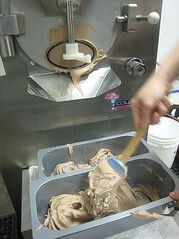 right: Then, they are mixed well with the gelato. 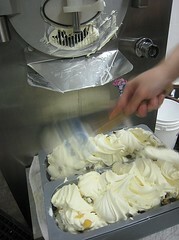 Then, more mounds of gelato are placed in the pan. 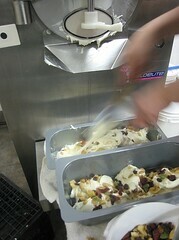 left: More fruits/nuts go on the gelato. 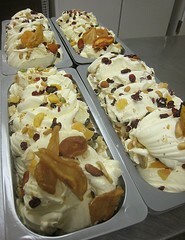 right: Fruits/nuts mixed in with the gelato. 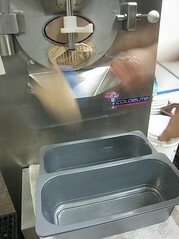 More gelato is mounded into the pan. 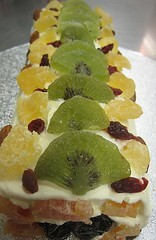 More sprinkling or decorating with the fruits and nuts finishes it! Check out that live-action mounding once again (top of page). 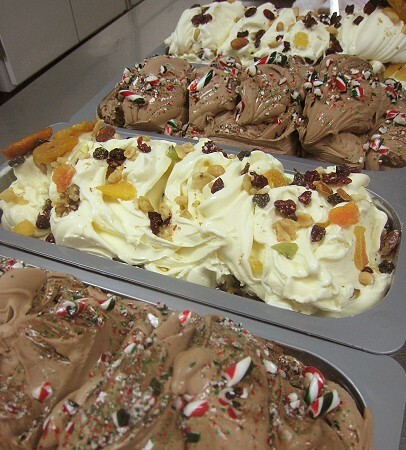 Here they are, Christmas Cake Gelato and Peppermint Chocolate Gelato! 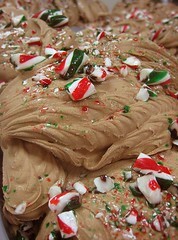 For fun, an actual "Christmas Cake" was created using the Christmas cake flavor. Gelato cakes at VIVO! are usually round (with the occasional heart shape). This time, a log was created. 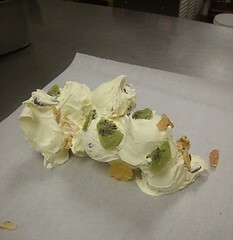 Christmas cake gelato was dolloped onto a sheet of parchement paper and more fruits and nuts were added. 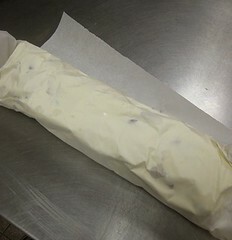 It was rolled up and placed in the freezer to harden. 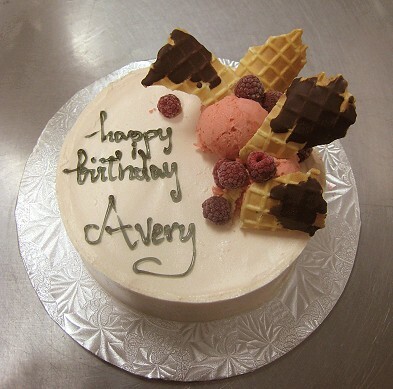 The hardened log was placed on a cake board and a layer of more gelato was smoothed onto it. 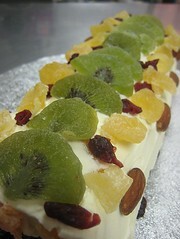 Then, it was studded with more fruits and nuts. 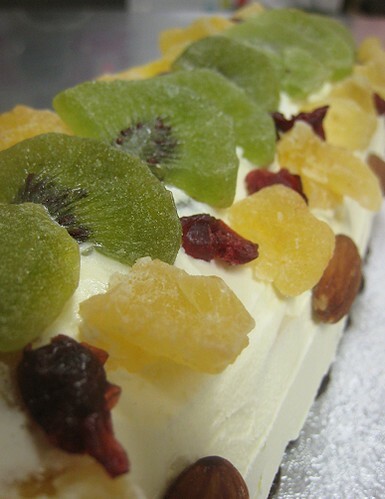 Before we finished our "photo shoot", we stole a shot of this cake that was being finished for an order. Whoever Avery is, she's one lucky girl. This post is our participatory entry to the November edition of Foodbuzz's 24 Meals, 24 Hours, 24 Blogs event, a worldwide live event celebrating the diversity of the food blogosphere. The field trip is a change of pace for our blog. It wasn't too busy at VIVO! Gelato when we held the photo shoot. Understandable, I guess, as the weather was miserable. 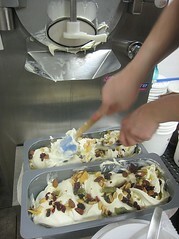 But, we eat gelato whatever the weather. 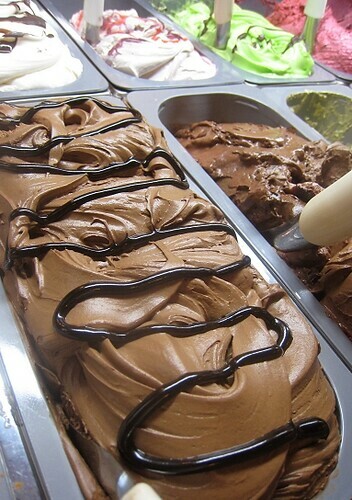 Gelato is dessert, after all! Thank you to Foodbuzz and VIVO! Gelato for making this post possible. 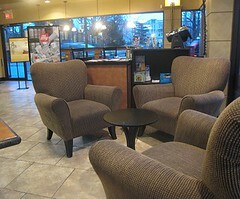 All photographs taken at the Kerrisdale location of VIVO! Gelato. All fish are bought with good intentions. One fine morning, a long, long time ago, I bought two fillets of steelhead trout. I cherish those weekdays when I am lucky enough to insert at least half an hour of my grocery shopping among other work errands. It means that I will be able to go see what fish are available that day -- and it means that we will be having a seafood meal that night. At least that is how the story goes in my head. On some days, no particular fish strike my fancy. On those days when I have to have some seafood, my go-to fish is always steelhead trout. It's usually available, it's not expensive, and the freshness and quality of the fish on sale are often good. On some days, the plot further loses its momentum. The main characters lose their way, becoming too tired or too lazy to cook that night. The main characters would be us, by the way. The fish that have been bought with the best of intentions end up sitting in the fridge that night. And on to the next night. After the 2nd night, I usually start to panic. If there's anything I'm scared of, it's fishy fish. I dread opening up the bag or the tray (because being too lazy, we usually do not store fish the proper way, putting it on ice) and being assaulted by the smell of fishy fish. I dreaded opening that tray of steelhead trout. I gathered up my courage and finally ripped the plastic off of the tray. Hm, so far so good. I smelled the fish. It did not have "absolute freshness". On the scale of 1 to 10, with 10 being the absolute, these fillets of trout rate about a 6.5. Not a very high rating but serviceable. Oh well. It was my fault for letting the fish languish two days in the fridge, so I couldn't really blame anybody. I couldn't start chastising myself either so the best thing to do is to deal with my 6.5 fish. I started going through our cooking options for 6.5 fish when in the corner of my eye, I espied a package of something. Enter my hero, MISO PASTE. How fortuitous that we have some miso paste sitting in the fridge! See, laziness builds upon laziness, like standing on the shoulders of giants or something to that effect. The miso paste was supposedly for some miso soup that we never got around to doing. No miso soup for us, but yes miso marinade for our trout. I started by mixing some miso paste with some whole grain and dijon mustards, adding some honey and rice vinegar along the way. 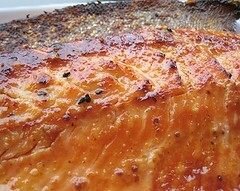 A few drops of sesame oil and I have made a miso-mustard marinade for my 6.5 out of 10 steelhead trout fillets. I slathered on the miso marinade on the fish, covered the fish with some parchment paper, weighed them down with a Pyrex tray, and put them back in the fridge for 2 to 4 hours. Thirty minutes before dinner time, I got my fish out of the fridge and took away the parchment paper. The miso marinade has sunk into the fish and -- lo and behold! -- the fish now smells as fresh as the day it was caught! From a 6.5, these babies are now a 10! 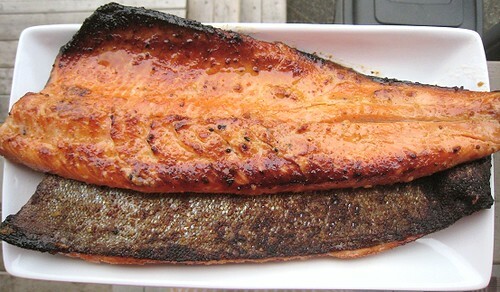 I baked the fillets in the oven, 450F for about 20-25 minutes, and then prepared a glaze for the fish containing a bit of soy sauce, honey, rice vinegar, mustard, and a few drops of sesame oil. I added more honey because I wanted it to be sweetish glaze and I wanted to get more caramelization on the fish. To celebrate the fish's "rise" to the top of the freshness scale, I even broiled them, quite diligently if I may so myself, brushing and rebrushing with the glaze industriously, paying close attention to it all the way until they were done and delicious. 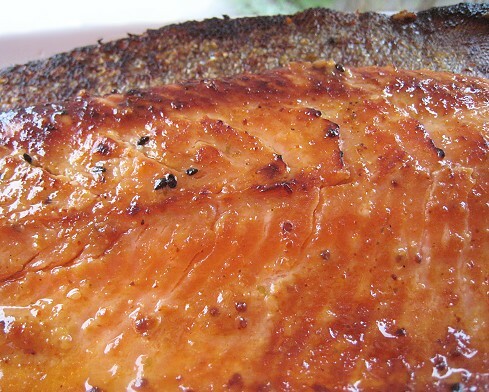 We had guests that night and we served this miso-marinated trout. From the reactions of our guests, it seemed that this dish rated very high. I dare not hope, of course.